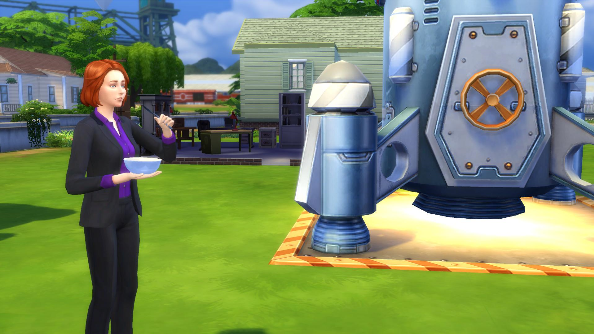 In The Sims 4 you can build a rocket ship and catapult your Sims into space. This got me thinking: who would I really like to fire at the moon? The answer was pretty clear: Fox Mulder, protagonist of The X-Files and serial lover of all things alien. 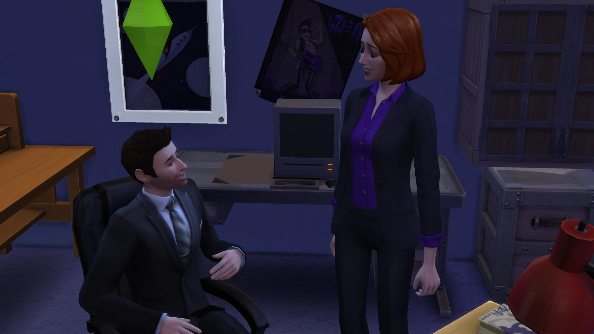 So I built Mulder’s office in the game, a Sim who was a rough approximation of David Duchovny, and set him to work. Also along for the ride was his faithful FBI partner Dana Scully, because someone needs to remind him about the science. This can’t possibly work, right? With Mulder and Scully moved into their newly re-located office, I needed to fill their brains with knowledge that would make their journey into space possible. 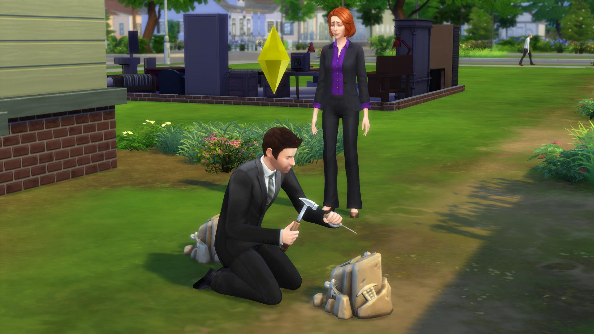 You can increase a Sim’s skill in various fields by getting them to read books. Mulder took this instruction as a prompt to read sci-fi books, which doesn’t exactly inform you on how to propel an object across the galaxy. Thankfully Scully kept a level head building her ‘logic’ skills so she could constantly tell Mulder that there had to be a logical explanation for whatever he saw in the skies. Within hours Mulder was already coming up with far-fetched conclusions about everyday occurrences. After refusing to sit and study as I’d asked and breaking into their neighbour’s back garden, the duo dug up a fossil. Mulder was convinced that he’d discovered the claw of some hideous monster. Scully seemed less than sure, and a quick look at the fossil’s tool tip revealed that it contained a human hand, not a scaly claw. With Mulder’s interest in the paranormal growing, I built an observatory in their garden to allow him some time to stargaze and hopefully build up some science skills. He was instantly enthralled by it, jumping in and spinning the telescope in all directions to get a closer look at whatever’s up there in the inky black. Mulder stayed in the observatory for eight hours straight. Obsessed by stargazing, he managed to forget to go to work, even when Scully was screaming through the observatory door for him. FBI cases are tough work, and being late wasn’t going to help his reputation at the bureau (they already call him ‘Spooky’ Mulder. God forbid they start calling him ‘Tardy’ Mulder, too!). Predictably, his lack of sleep caused him fall behind on work and forget to attend a big presentation meeting. His superiors found him slumped under the desk snoring. Sent home with a caution, Mulder was doomed to spend the evening in a terrible mood. Scully realised that Mulder was feeling down, so proposed a crazy scheme to him. Clearly now was the time to get close and personal with an alien. 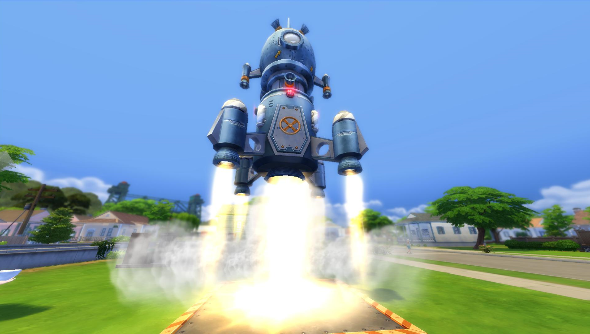 The build menu contains the option for a ‘steampunk space rocket’, and I dropped one down in the garden. It’s an incredibly expensive item, and requires even more money during its construction. 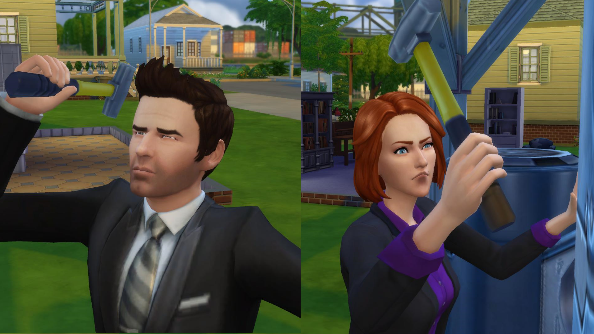 Thankfully you can do this thing called ‘cheating’ in The Sims that gives you loads of cash. I like to think of it as a bursary from the FBI. I’d finally managed to get Mulder reading books about engineering rather than aliens too, so his Rocket Science skill was high enough to build a ship with a few upgrades. With a bit of luck, this tin can wasn’t going to explode the moment it hit the atmosphere. With the rocket constructed, the duo took a quick selfie in front of their achievement, and then set about the mission. Mulder strapped on his space suit, opened the shuttle bay doors, and prepared to blast off into the unknown. Scully… well Scully just ate a bowl of cereal, seemingly non-plussed that her best friend was potentially about to go and get himself killed. 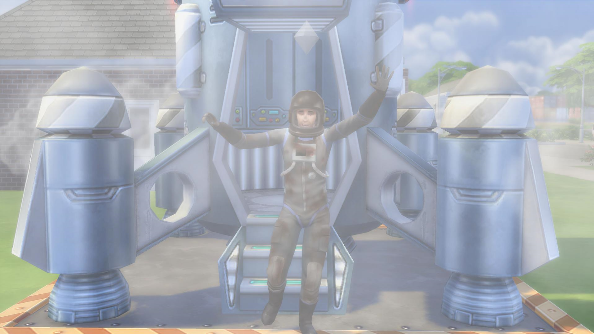 When you explore space in The Sims 4, your Sim’s journey is chronicled through text-adventure style prompts that appear periodically during their ‘vacation’. Soon after Mulder broke atmosphere, I was alerted that he’d seen a UFO on the scanners, and the craft was sending out a distress signal. Mulder cruised in to answer the call, but discovered the whole thing was a dirty ruse. The signal came from a grinning three-eyed, sixteen-tentacled alien, who challenged Mulder to a duel. At this point I could choose to have Mulder run away, or set phasers to kill. With weapons powered up, the ships started taking pot-shots at each other. I soon learnt that challenging an alien with fourteen more hands than me to a duel is a bad idea. Missiles struck Mulder’s ship, and warning lights began to wail and spark. The game asked if I was ready to give up, but I instructed Mulder to stick at it. In a slick final-hour manoeuvre, Mulder recalled something he discovered on a previous adventure (presumably one never-before-seen on television) and whistled an alien mating call into the radio comms. The horny beast was suddenly distracted, allowing Mulder a chance to bombard its hull with laser blasts. The alien finally admitted defeat, offering praise for Mulder’s combat skills. He also presented us with a trophy: a jar filled with the corpse of a blue space slug. 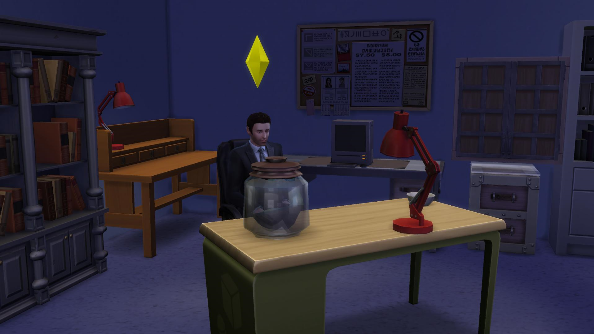 With the jar proudly displayed on his desk, Mulder relaxes for the rest of the day, safe in the knowledge that the truth genuinely is out there. He’s seen it. Scully seems less convinced; she probably thinks that jar is housing an eel that somehow managed to get attached to a NASA probe. Perhaps if she hadn’t been so busy eating a bowl of Frosties she could have gone to space, too. Silly Scully.